This is definitely another holy grail product of mine. Essential, you did it again. 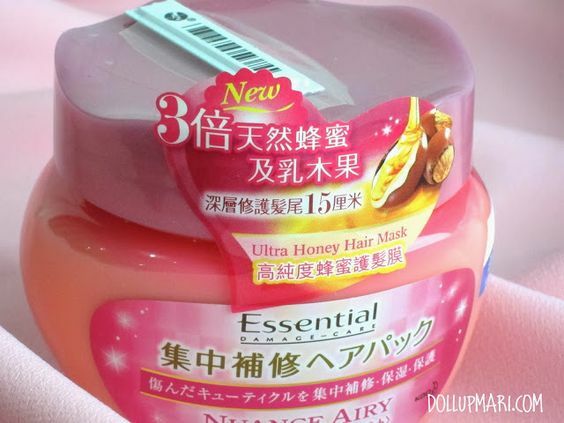 Most of you have just seen my review a few days ago on their Nuance Airy shampoo and conditioner, but today I'm going to talk more about their Ultra Honey Hair mask in more detail. So basically this is a spin off in their Nuance Airy line. This is a wash off deep conditioner, unlike the morning hair health spray and leave on hair milk they sell. I just LOVE using this product, be it be just for a weekly hair rejuventation episode or for when my hair's a bit frizzy or dry. I simply apply this alongside my hair conditioner, leave it on for about five minutes then wash it off. I don't use this product everyday because it's very nourishing, using this too often I think would already make my hair very oily given that I'm already getting a lot of nourishment from the shampoo and conditioner. Wash off wise, this takes a bit of time to wash off because it's very nourishing, and a bit slippery and all. But the scent is really lovely, it smells like the shampoo and has a fruity-floral-honey scent. I also love that it's made in Japan but doesn't cost too much! I got this jar from Hong Kong for 48 HKD (Php 264) and it's already a relatively jar with 200 grams of treatment inside. Per treatment I more or less just need about 5 grams, and just need to use this once a week (twice a week is already a lot), so it can last for almost a year if you're going to follow my schedule (given that it will last about 40 weeks and a year has 48 weeks). This product just does miracles for my hair. It can make my hair bouncy and full of volume even while maintaining softness and shine. I have no problems with oiliness because my oily scalp is still fine even after 16 hours from the last shower. Compared to just using the conditioner alone, this does make my hair a bit oilier than usual, but still it's still better than the other conditioners I've used that just make my hair oily. It also makes my hair smell so nice! My hair smells like fruits and honey all day! The formulation is really thick, and this is why the product is able to be really nourishing. Even when I tilt the jar, the product does not spill out. Even if I lightly pat it, the product is still there. I have to dig my fingers into the jar a bit to be able to get product because it does not swipe so easily. This is something I find positive because it just shows that it's really thick and creamy. I was able to prove that the product was really good was when I colored my hair and it was dried up right after the coloring. After using this hair mask, my hair was back to its virgin condition and was super soft and bouncy again. It was like my hair was never chemically treated!!! I actually wish that I actually had this on hand when my hair got a botched digital perm job huhu. Anyways, that concludes my review and thoughts on this product! Thankfully they also make this in the Rich Premiere variant! What's your go-to product for dry hair? Please tell me in the comments box!! !